About : Having looked at the diverse range of published StoryCubes on the Diffusion and Bookleteer websites, I found that each had an inspiring story to tell or contained overlooked information to be acknowledged. But it wasn’t just the content of these publications which interested me, it was how the content was presented in the form of a cube. When holding a cube you find yourself tempted to see whats on the other faces, with this in mind I decided to make a game which will go hand in hand with the eBooks. The concept of the game was fairly simple, from the starting point pick a path (line) and follow it around the cube until you reached a destination. Several paths would overlap, giving the player a choice to change direction. Once the player had reached a destination, they will use the eBook to find out its description. With this idea it creates a different kind of interaction with the cube, instead of being guided by text, the player is free to choose and explore any chosen path. Or in some cases the player might try to work out a way to reach a specific destination. Apart from readjusting the orientation of one or two pages, the eBook was fairly straightforward to make. Without the need of additional glue or staples and only using the slotting mechanism the finished eBook was very secure. 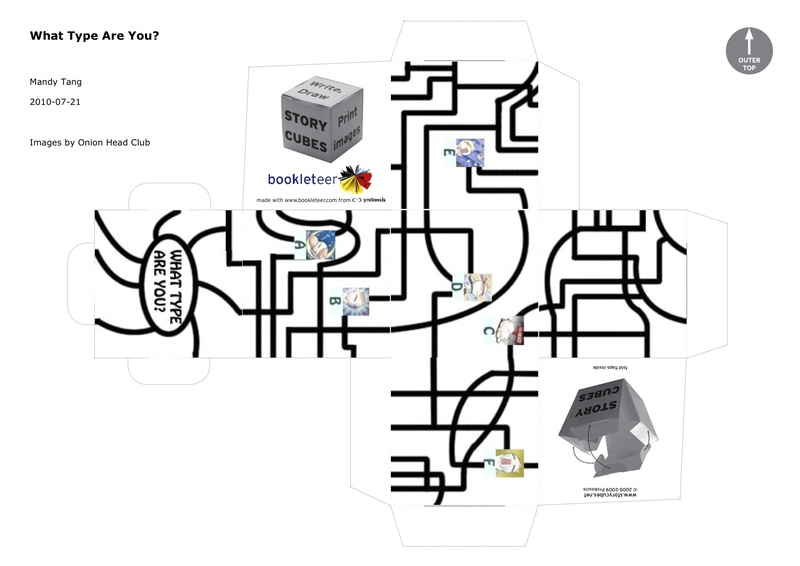 Overall I had fun and enjoyed making the StoryCube with the eBook and look forward to seeing what other people create.